The next 22 months until President Barack Obama leaves office promise to be the most challenging period in the history of US-Israel relations. Now unfettered by electoral concerns, over the past week Obama exposed his ill-intentions toward Israel in two different ways. First, the Justice Department leaked its intention to indict Democratic Sen. Robert Menendez on corruption charges. 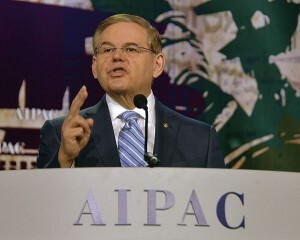 Menendez is the ranking Democratic member, and the former chairman, of the Senate Foreign Relations Committee. He is also the most outspoken Democratic critic of Obama’s policy of appeasing the Iranian regime. The Menendez prosecution tells us that Obama wishes to leave office after having vastly diminished support for Israel among Democrats. And he will not hesitate to use strong-arm tactics against his fellow Democrats to achieve his goal. We already experienced Obama’s efforts in this sphere in the lead-up to Prime Minister Benjamin Netanyahu’s speech before the joint houses of Congress on March 3 with his campaign to pressure Democratic lawmakers to boycott Netanyahu’s address. Now, with his move against Menendez, Obama made clear that support for Israel – even in the form of opposition to the nuclear armament of Iran – will be personally and politically costly for Democrats. The long-term implications of Obama’s moves to transform US support for Israel into a partisan issue cannot by wished away. It is possible that his successor as the head of the Democratic Party will hold a more sympathetic view of Israel. But it is also possible that the architecture of Democratic fund-raising and grassroots support that Obama has been building for the past six years will survive his presidency and that as a consequence, Democrats will have incentives to oppose Israel. The reason Obama is so keen to transform Israel into a partisan issue was made clear by the second move he made last week. Last Thursday, US National Security Adviser Susan Rice announced that the NSC’s Middle East Coordinator Phil Gordon was stepping down and being replaced by serial Israel-basher Robert Malley. Malley, who served as an NSC junior staffer during the Clinton administration, rose to prominence in late 2000 when, following the failed Camp David peace summit in July 2000 and the outbreak of the Palestinian terror war, Malley co-authored an op-ed in The New York Times blaming Israel and then-prime minister Ehud Barak for the failure of the negotiations. What was most remarkable at the time about Malley’s positions was that they completely contradicted Bill Clinton’s expressed views. Clinton placed the blame for the failure of the talks squarely on then-Palestinian leader Yasser Arafat’s shoulders. Not only did Arafat reject Barak’s unprecedented offer of Palestinian statehood and sovereignty over all of Gaza, most of Judea and Samaria and parts of Jerusalem including the Temple Mount, he refused to make a counter-offer. And then two months later, he opened the Palestinian terror war. During Obama’s 2008 presidential campaign, then-senator Obama listed Malley as a member of his foreign policy team. When pro-Israel groups criticized his appointment, Obama fired Malley. But after his 2012 reelection, no longer fearing the ramifications of embracing an openly anti-Israel adviser, one who had documented contacts with Hamas terrorists and has expressed support for recognizing the terror group, Obama appointed Malley to serve as his senior adviser for Iraq-Iran-Syria and the Gulf states. Still facing the 2014 congressional elections, Obama pledged that Malley would have no involvement in issues related to Israel and the Palestinians. But then last week, he appointed him to direct the NSC’s policy in relation to the entire Middle East, including Israel. The deeper significance of Malley’s appointment is that it demonstrates that Obama’s goal in his remaining time in office is to realign US Middle East policy away from Israel. With his Middle East policy led by a man who thinks the Palestinian goal of destroying Israel is legitimate, Obama can be expected to expand his practice of placing all the blame for the absence of peace between Israel and the Palestinians solely on Israel’s shoulders. Malley’s appointment indicates that there is nothing Israel can do to stem the tsunami of American pressure it is about to suffer. Electing a left-wing government to replace Prime Minister Binyamin Netanyahu will make no difference. Just as Malley was willing to blame Barak – a leader who went to Camp David as the head of a minority coalition, whose positions on territorial withdrawals were rejected by a wide majority of Israelis – for the absence of peace, so we can assume that he, and his boss, will blame Israel for the absence of peace over the next 22 months, regardless of who stands at the head of the next government. In this vein we can expect the administration to expand the anti-Israel positions it has already taken. The US position paper regarding Israeli-Palestinian negotiation that was leaked this past week to Yediot Aharonot made clear the direction Obama wishes to go. That document called for Israel to withdraw to the indefensible 1949 armistice lines, with minor revisions. In the coming 22 months we can expect the US to use more and more coercive measures to force Israel to capitulate to its position. The day the administration-sponsored talks began in July 2013, the EU announced it was barring its member nations from having ties with Israeli entities that operate beyond the 1949 armistice lines unless those operations involve assisting the Palestinians in their anti-Israel activities. The notion that the EU initiated an economic war against Israel the day the talks began without coordinating the move with the Obama administration is, of course, absurd. We can expect the US to make expanded use of European economic warfare against Israel in the coming years, and to continue to give a backwind to the anti-Semitic BDS movement by escalating its libelous rhetoric conflating Israel with the apartheid regime in South Africa. US-Israel intelligence and defense ties will also be on the chopping block. While Obama and his advisers consistently boast that defense and intelligence ties between Israel and the US have grown during his presidency, over the past several years, those ties have suffered blow after blow. During the war with Hamas last summer, acting on direct orders from the White House, the Pentagon instituted a partial – unofficial – embargo on weapons to Israel. As for intelligence ties, over the past month, the administration announced repeatedly that it is ending its intelligence sharing with Israel on Iran. We also learned that the vice chairman of the Joint Chiefs of Staff is being fingered as the source of the leak regarding the Stuxnet computer virus that Israel and the US reportedly developed jointly to cripple Iran’s nuclear centrifuges. He has also used diplomacy to harm Israel. Last summer, Obama sought a diplomatic settlement of Hamas’s war with Israel that would have granted Hamas all of its war goals, including its demand for open borders and access to the international financial system. Now of course, he is running roughshod over his bipartisan opposition, and the opposition of Israel and the Sunni Arab states, in the hopes of concluding a nuclear deal with Iran that will pave the way for the ayatollahs to develop nuclear weapons and expand their hegemonic control over the Middle East. AMID ALL of this, and facing 22 months of ever more hostility as Obama pursues his goal of ending the US-Israel alliance, Israelis are called on to elect a new government. This week the consortium of former security brass that has banded together to elect a leftist government led by Isaac Herzog and Tzipi Livni accused Netanyahu of destroying Israel’s relations with the US. The implication was that a government led by Herzog and Livni will restore Israel’s ties to America. Yet as Obama has made clear both throughout his tenure in office, and, over the past week through Malley’s appointment and Menendez’s indictment, Obama holds sole responsibility for the deterioration of our ties with our primary ally. And as his actions have also made clear, Herzog and Livni at the helm will receive no respite in US pressure. Their willingness to make concessions to the Palestinians that Netanyahu refuses to make will merely cause Obama to move the goalposts further down the field. Given his goal of abandoning the US alliance with Israel, no concession that Israel will deliver will suffice. And so we need to ask ourselves, which leader will do a better job of limiting the danger and waiting Obama out while maintaining sufficient overall US support for Israel to rebuild the alliance after Obama has left the White House. The answer, it seems, is self-evident. The Left’s campaign to blame Netanyahu for Obama’s hostility will make it all but impossible for a Herzog-Livni government to withstand US pressure that they say will disappear the moment Netanyahu leaves office. In contrast, as the US position paper leaked to Yediot indicated, Netanyahu has demonstrated great skill in parrying US pressure. He agreed to hold negotiations based on a US position that he rejected and went along with the talks for nine months until the Palestinians ended them. In so doing, he achieved a nine-month respite in open US pressure while exposing Palestinian radicalism and opposition to peaceful coexistence. On the Iranian front, Netanyahu’s courageous speech before Congress last week energized Obama’s opponents to take action and forced Obama onto the defensive for the first time while expanding popular support for Israel. It is clear that things will only get more difficult in the months ahead. But given the stakes, the choice of Israeli voters next Tuesday is an easy one. * Correction: An earlier version of this article incorrectly reported that Hillary Clinton was reportedly involved in leaking sensitive information related to joint Israel-US operations to the media.